What Are Some Healthier Choices To Overcome A Hangover? Hangover cures of varying types often appear in several websites and health magazines. One claim of a hangover cure suggested that consuming raw oysters may treat a hangover. People may develop some unpleasant signs and symptoms after a bout of heavy alcohol consumption. Commonly termed as having a hangover, these signs and symptoms include headaches, nausea, vomiting, dryness of mouth, muscle cramps, and dizziness, to name a few. These may vary depending on the type and concentration of alcohol consumed, the amount consumed, the rate at which it was consumed, and the health condition of the individual drinking alcohol. Hangover cures of varying types often appear in several websites and health magazines. One claim of a hangover cure suggested that consuming raw oysters may treat a hangover. This is a dangerous unscientific myth that has been set right by the Food and Drug Administration (FDA) in their website by discrediting it. Currently though, there is no conclusive proof or evidence to suggest definite cures for a hangover. According to established studies and scientific opinion, hangovers can either be avoided or its symptoms can be eased out, but they may not be outright cured. A drug abuse review by Joris C Verster of Utrecht University states that most remedies for alcoholic hangover are not significantly effective in treating them. Some remedies may cure some specific symptoms like headaches, but fail to treat the overall hangover symptoms that last till the effect of alcohol wears out. 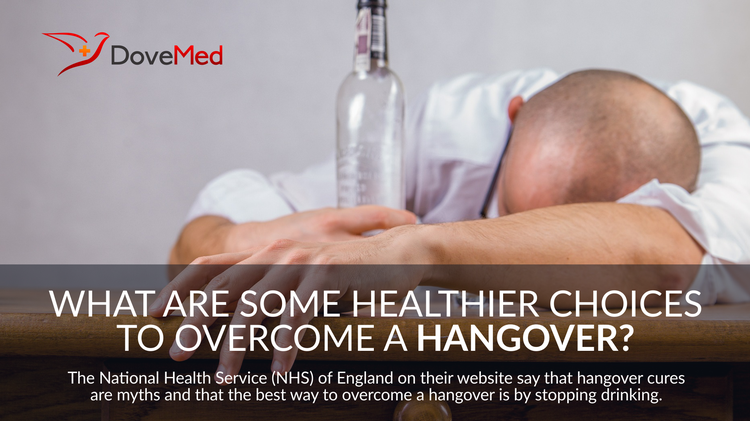 The National Health Service (NHS) of England on their website say that hangover cures are myths and that the best way to overcome a hangover is by stopping drinking. However, if an individual does drink, it is advised that he or she drink sensibly within recommended guidelines and quantities. Another advice given by the NHS to ease hangover symptoms is to drink Bouillon soup, which is safe for a fragile stomach after alcohol consumption. The Healthdirect website of the Australian government gives a few suggestions to ease hangover symptoms. These include drinking bland liquids, such as water, soda, or isotonic liquids. The use of paracetamol based over-the-counter painkillers is more preferable than aspirin, because aspirin may further cause trouble with the stomach. Another method to ease hangover symptoms is by consuming sugary foods. But both the NHS and Healthdirect of Australia recommend that before consuming sugary foods one needs to make sure that their stomach can handle it, or else ensure that their stomach is settled well-enough. Some hangover symptoms may also be exacerbated by bright shining lights, loud music or noise, smoking, and lack of proper sleep. These conditions may have to be avoided in order to hasten the pace of recovery. Some best practices to avoid hangovers include the practice of not drinking alcohol on an empty stomach. Dark-colored drinks such as wine, brandy and whiskey are said to contain chemicals that may worsen hangover symptoms. Hence, it would be wise to avoid such dark-colored drinks to the extent possible. Alternatives suggested to people who wish to drink heavily on occasions is to replace the dark-colored drinks with vodka and gin. Consuming water or non-sparkling soft drinks in between alcoholic drinks can also help reduce a fast absorption of alcohol into the bloodstream. C Verster, J., & Penning, R. (2010). Treatment and prevention of alcohol hangover. Current drug abuse reviews, 3(2), 103-109. Pittler, M. H., Verster, J. C., & Ernst, E. (2005). Interventions for preventing or treating alcohol hangover: systematic review of randomised controlled trials. Bmj, 331(7531), 1515-1518.